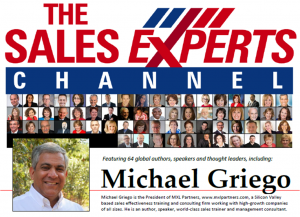 MXL’s Michael Griego will be speaking on Effective Executive Conversations on March 2, 2017 @ 11:00-12:00am PT on The Sales Experts Channel. Are you an effective sales communicator? Can you go toe-to-toe with senior executives and drive a purposeful, strong, relevant, engaging and effective sales conversation? And not sound like a salesperson? Easier said than done. This power-packed webinar will provide practical sales enablement frameworks to improve and impact executive sales conversations.